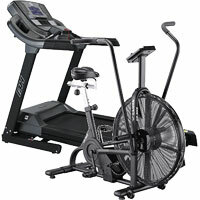 Which is Better a Treadmill or Exercise Bike? Posted on April 15, 2019 , in Exercise Bikes. Before answering the question of which machine is better, you’ll need to understand what you’re trying to achieve with your workout. If toning specific muscles is your goal, you may end up with one answer. If losing weight is your goal, you may come up with another. If protecting injured body parts is your main concern, you’ll also end up with a different answer. If your aim is to burn calories and lose weight, it’s probably best to hit the treadmill rather than ride an exercise bike. When you’re walking and running, you’re also carrying your full body weight. When you’re on an exercise bike, much of your weight is being supported by the machine itself. If you’re looking for maximized calorie burning, the weight-bearing exercise provided by the treadmill will be much more effective compared with a similar intensity of workout on an exercise bike. If you’re looking to concentrate on working out your legs, an exercise bike is the way to go. Exercise bikes work the gluteal muscles, calves, hamstrings, hip flexors, and quads while allowing most of the rest of your body to relax. Recumbent bicycles are even better for working the leg muscles as you’re not able to rely on gravity to help with the cycling motion. If you’re looking for more of a full body workout, get on the treadmill and start running. Not only will your legs receive a workout, your upper body will get in on the action as well. This type of workout can ward off osteoporosis while preserving bone mass. As a full weight bearing exercise, it will ensure your joints are put to use as well. Exercise bikes can be used to avoid exacerbating existing injuries. If you have joint problems, upper body injuries or are recovering from knee ligament surgery, an exercise bike can allow you to remain active without making your injuries worse. Because it reduces impact, concentrates on the legs and keeps the knees stable, an exercise bike can allow exercise while recovering from a wide range of injuries.